The value of entrepreneurial opportunities for Clemson students really can’t be underestimated. Clemson GC has a brand new section of The DEN, which stands for the Design and Entrepreneurship Network, this Fall semester in partnership with the Bioengineering and mechanical engineering divisions. I am hoping to see other departmental divisions pop up around campus and join in the excitement next semester. IGAEA GCEA Conference logo. Photo credit Bill Delgado. As you have probably heard me say many times, I am a bit of a sucker for opportunities to learn. So, I was lucky enough to find myself in the tiny town of Mansfield, Ohio this summer for the International Graphic Arts Educators Association IGAEA conference. Clemson GC sent three faculty members to the conference- Dr. John Leininger, Dr. Charles Weiss, and me- talk about being in great company! This was actually my first year attending an IGAEA event and during the conference, they officially announced that the organization will be operating under a new name going forward- Graphic Communications Education Association GCEA. The new logo, branding, and website mockup were presented by the leadership committee during the conference. In case you missed hearing about the #GC340 basketball promotional video shoot during Fall 2013, I wanted to share some of the pictures from the location day. I really do love just about every aspect of film making, but probably the part of the process that I think is the most exciting, is the shoot day. Bring on the talent, the lights, the cameras, the microphones, and let’s see if we can make the magic happen! Yes, I admit there is a lot of planning that goes into those few short hours on set, but if all goes (mostly) well, then by the end of that time, you’ll have on film what it takes to edit your masterpiece. Photography credit goes to Lisa Car and I took some of the other shots. 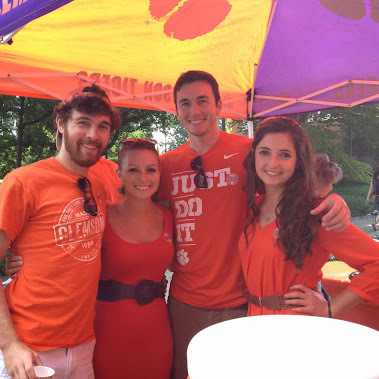 ClemsonGC Fall 2013 Homecoming Tailgate. PREVIOUS: Is WordPress the best CMS for your business? NEXT: Congratulations to our @ClemsonGC December graduates! At Clemson, we call it the Social Media Listening Center, but no matter the name, the technology and goals are similar. The SMLC is used for various reasons in web marketing and development. A company may need to monitor sentiment about their brand online or know when to step in and offer a response to a widely spreading positive or negative story or even follow how competitors are using terms in order to tailor their google adwords campaign. By scraping all public mentions of particular key words, data can be mined and interpreted in order to get a clear picture of sentiment on the internet. If you haven’t had a chance to visit the Social Media Listening Center, you should. You’ll be blown away by the technology’s capabilities and by how “audible” we really are when we post something online.